Cara was in Black Rise again, looking for targets. Over the last few weeks she had received several nasty form letters from CONCORD, advising her to stop shooting the locals, but she wasn’t about to heel to those pretentious phonies. Jumping through the stargate, she entered Reitsato to find Aaril from Aideron Robotics in system. Hoping to entice her into a fight, Cara warped her trusty Breacher to one of the military complexes in the system. Upon exiting warp she activated the acceleration gate, throwing her ship forward into a quiet piece of space, occupied by a single Gallente Federation frigate doing it’s rounds. Scanning her ship ID, it determined she wasn’t a Caldari supporter and left her alone. 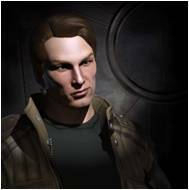 Noticing her Breacher in system, Aaril broadcasted a message, telling Cara she wasn’t in a combat ship and didn’t intend to fight anyone. Noticing the Helios on scan, Cara could see why. Ah well. Sometimes you have to make ISK if you want to be a combat pilot. She was in the midst of typing a reply for the computer to encrypt and broadcast when a Daredevil suddenly dropped out of warp right next to her ship. Curse her slow typing skills! She had been distracted and did not notice the warning alarms her directional scanner was making. Hurriedly dashing across the cockpit to the controls, she gunned the afterburner and started heading toward the ship, releasing her hobgoblins and activating her rocket launchers as she went. The Daredevil was already tearing into her shields with it’s railguns. Fortunately, your typical Breacher was designed to take a bit of a beating. This was not a typical Breacher, however. Cara had a few tricks up her sleeve, and was just hoping it would be enough to save her from the expensive Serpentis spaceship laying into her shields. Unfortunately, she wasn’t making any headway toward the Daredevil and its railguns were having no problem tracking her ship at 5 km distance. Already she had used several of the booster charges in the ancillary shield booster module, while her rockets were doing rather meager damage to the Daredevil. Time for the surprise. Activating her energy neutralizer, she dangerously overloaded the afterburner to push a bit more speed out of the ship. Despite the Daredevil’s incredibly powerful stasis webifier, she managed to pull within 3 km, then 2.5 km. Starting to orbit, the railguns finally started to show signs of imperfect tracking, occasionally missing her ship completely. Checking her shield booster, she found only two charges left. They were quickly used up. The Daredevil managed to land two powerful hits that wiped out the rest of her shields and penetrated the Breacher’s armor. It wasn’t looking good for her ship. However, just then a bell sounded, indicating her warp drive system had come back online – the Daredevil must have deactivated its warp scrambler. This was her chance to escape. Aligning to a distant planet, she prepared to warp, but suddenly realized an eerie silence had fallen over her ship. It had been shuddering and twisting in orbit as the rounds of antimatter crashed into it, but now, nothing. The Daredevil had stopped firing. Then it hit her. Its capacitor had run dry. That’s why it had deactivated its warp scrambler, and its hybrid turrets could not function without power. It was now just drifting, unable to run its afterburner or stasis webifier to control its range. Quickly pulling her ship back into orbit she refocused her weapons on the Daredevil and watched its armor quickly disintegrate without the ability to repair itself. Her rockets began to pound through the hull itself and finally, it exploded. The capsule warped off as soon as the ship blew, but Cara was too excited to care. Approaching the wreck she found an assortment of extremely valuable items which would fetch a wonderful price in Dodixie. Looting everything she could carry, she said goodbye to Aaril and set a course for the market. On the way home she assessed the damages to her ship. Many of the modules were still hot to the touch, and some had melted around the edges. Upon checking her rocket launchers, she came to a startling realization. One of them was still fully loaded, indicating that her weapon control system had malfunctioned and fired only a single launcher during the fight. No wonder her damage application had been poor. Oh well. She had still come out on top. No one expects a neut Breacher. Dig the storytelling. Keep it up!